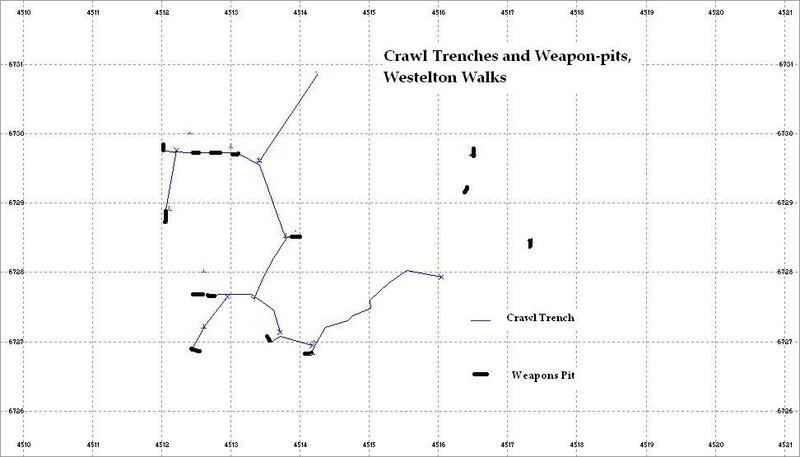 Managed to get some recording of anti-landing trenches at Sutton Common before the rain came. Sutton Common was also a training area right from the start of the war. I have come across several references to this location in battalion war diaries at NRA, including Gen A Brooke attending a demonstration of a tank attack through barbed wire and across an anti-tank ditch. As well as recording the anti-landing obstacles I had a wonder around and came across many earthworks, some certainly second war including the photo of a shell slit which was part of a group of shell slits and weapons pits in the vicinity of a dug-out (all would have been dug during training). Sutton Common is a huge area and will take much searching to see if other earthworks are present! On my last post, I said the destroyed concrete structures resembled no known pillboxes - that's because they are a concrete trench/weapons pit's. They seem to be constructed over an excavated pit, the spoil used to form a parapet on the main open embrasure. The roof is a massive two foot of concrete. They are reinforced with metal rods and a wire mesh. The roof is covered with turf, to camouflage the structures from aerial observation. Enough remains of two of the structures to produce these plans, of what I think they would have looked like (although as the plans show I'm no architect!!). In total there are six structures, three of which I think were identical, two in such bad condition nothing can be ascertained from them, and one which seems larger than the one described, is reinforced with RSJ's but probably is in too bad condition to determine a plan (although have not tried yet). In Mike Osbourne's book 'Pillboxes in Britain and Ireland' a plan of a similar shaped structure, although much larger was said to be for housing 4.5" howitzers in the Lowestoft area. Although these are clearly infantry structures, perhaps they were constructed along the same basis. About a yr ago, when asking for info on these on the PSG website, I got a reply (from AJ Ruddy I think) about concrete trenches being present also in the Walbleswick area. Although I have stated in the past I think the structures at W.Walks are mainly training, I am beginning to change my mind. I thought they were training due to the shear number of earthworks, also the whole area was certainly a firing range judging from the number of unexploded 2" mortars, shell shards and fired 303 cartridges. However the more I look at these structures, the more apparent it is becoming of the field of fire they had over the anti-tank ditch and track alongside the ditch. It has also occured to me that some of the earth works could be dummy positions????? If only I could get a grid ref of a platoon/company locality for this area! Oh, and the pencil in the plan photo's - just to get a focus lock for the camera! Visited Blaxhall Heath today to map the anti-landing trenches. To map all theses obstacles in Suffolk is a project in its own right! A wide deep trench appears to have been incorporated in the layout of this obstacle, not sure of the date or purpose of this trench. This site was apparently also used as a firing range - I found the remains of two tail fins of 2" mortars. 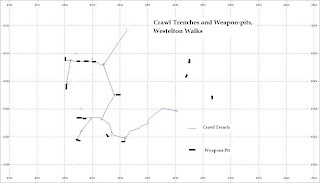 The layout of the trenches is typical - a grid pattern. The spoil was placed in piles at intervals along both sides of the trench to further improve the obstacle to any landing aeroplanes/gliders. Also some more work on the website today - its taking much longer than anticipated. If you have found this blog via the website, please be patient, I will get round to posting the field work stuff on it! Visit to Shingle Street today to record two pillboxes I'd seen in the summer but was unable to get two due to crops. These were a Type 22 with a L shaped blast wall and a Suffolk Square with damage to the blast wall. As with other Suffolk Squares in this area its lacks any concrete weapons shelf found in Suffolk Squares further north. I also came across a First War pillbox that I had not seen before. It is identical to the other nearby circular First War pillbox, in excellent condition but is virtually buried and hidden from view.